Clean surface with brush or broom, removing all loose sediment and dirt. Nail down any loose parts. Stir container thoroughly before using. Apply to dry surfaces ONLY with brush, roller or sprayer (tip size .017 to .023). DO NOT apply if rain is imminent within a 24 hour period of application. Clean tools with mineral spirits or kerosene in a well ventilated area. If material is too stiff during cold weather, keep in a warm area before using. 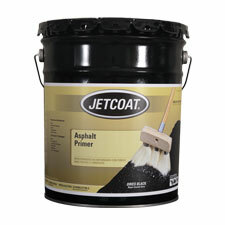 Provides an excellent base for JETCOAT Asphalt coatings and patching materials. 64135 4.75 gal. Pail 43 lbs.